This will allow you to avoid the ATM while they do what they do best, act curious, lazy, and keep you company. Just apply the cream to the back of your cat’s neck and pop open a can of tuna, because you know how much fun it is to spoil a chubby kitty. Does Advocate purple kill ticks? The bottom illustration on the box looks like one but the instructions don't mention ticks. No, Advantage Multi/Advocate for cats over 8.8 lbs does not kill ticks. What is the active ingredient in Advocate? Does it kill tape worms? Is the Advocate sold on here the same as what is available in the UK? My cat weighs in at 19.5 lbs. Will the advantage for cats over 8.8 lbs be enough? Yes. Advantage/Advocate for cats over 8.8 lbs. is formulated for cats your size. Thanks for the inquiry! Where is the product made? Is it safe for cats? 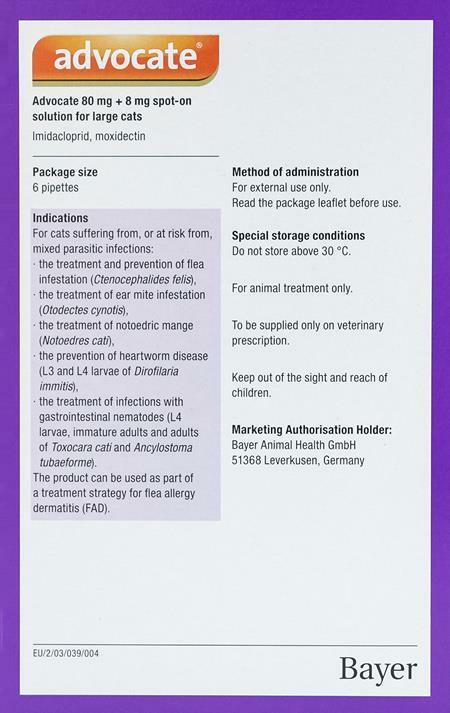 Hi, You can find general information in the following link <a href="http://goo.gl/U9DmxL">http://goo.gl/U9DmxL</a> Advocate for Cats is a Bayer Product. Yes Advocate for cats is safe and also safe for kittens, and lactating and pregnant cats. I hope this helps. Okay, so this stuff works on my cats flea-wise but...it stinks bad and is oily. It takes a few days to get rid of the stink too. Not only your cat stinking, but anything your cat comes in contact with. Especially you! For the first day or two, the smell fills the room too. One more thing too, it had a psycho reaction with my cats too. They keep chasing things and batting at things that aren't there for a few days afterward. The first day, they get sleepy but can't sleep well so I think it's like screwing with their minds and metabolism. We're not using this anymore. Happy to Have Your Site! I have used PetBucket for several years now.I'm a older customer on a fixed income...your prices allow me to keep my cat protected at a price I can afford. Thanks! Very pleased with your products & service. Thank you. Good product at good prices. Product takes a long time to arrive so plan accordingly. Communication is good through the process and worth the wait.